In light of the City’s recent decision to vacate yet another Downtown alley, Urban Angle is examining some of Kansas City’s most interesting in-between spaces, and why they are worth preserving. Every day this week, we will visit a different alley, each with its own unique contributions to the experience of the City. This is Part One of Five. 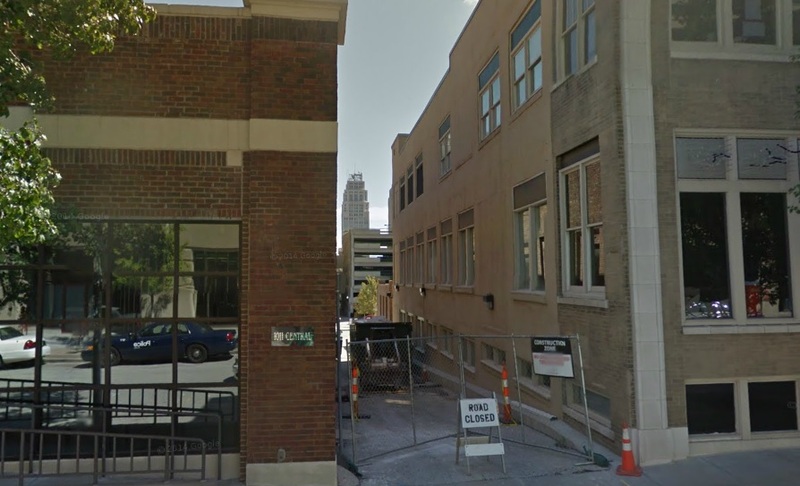 On October 21st, Kansas City’s Plan Commission voted to vacate both the north-south and east-west alleys Downtown between 10th, 11th, Wyandotte, and Baltimore Streets in order to accommodate a new skywalk connection for DST Realty on behalf of (the amazing and wonderful) Crossroads Academy. Presumably, the skywalk was an opportunity for DST Realty to consolidate their property and remove those pesky public uses that separate their parcels on the block. The Plan Commission took this vote even though the proposed skywalk did not require a vacation and would have worked just as well with an easement. The vacation also happens to violate the both the City’s adopted plan for Downtown (the Greater Downtown Area Plan) and the City’s new Transit-Oriented Development Guidelines. To make matters worse, the City received no compensation for abandoning this public resource on valuable Downtown real estate. 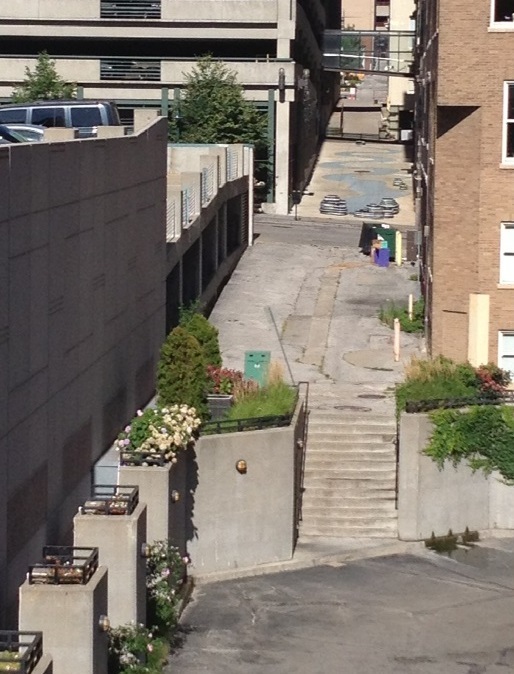 The City Plan Commission voted to vacate this east-west alley and the connected north-south alley to permit a a single skywalk between the two buildings, even though it violated City policy and an easement works just as well. This case got us at Urban Angle thinking about our Downtown alleys, and we have put together a list of a few of alleys we find the most interesting, for a variety of reasons. We’re curious to know which alleys are your favorites and why. Let us know in the comments and we’ll add it to the list! This Downtown alley is at the top of the list for a number of reasons. First, it is actually a continuation of the alley that was vacated in October. 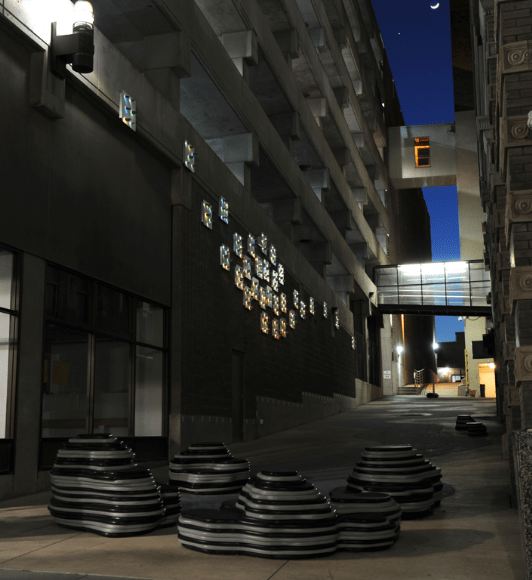 This alley constitutes the middle link of a continuous three block connection that ties together the KCATA Transit Plaza, Downtown Library, and Lyric Theater, among other destinations. This is the first of a five part series, exploring a different alley each day this week. Check out Part Two tomorrow. 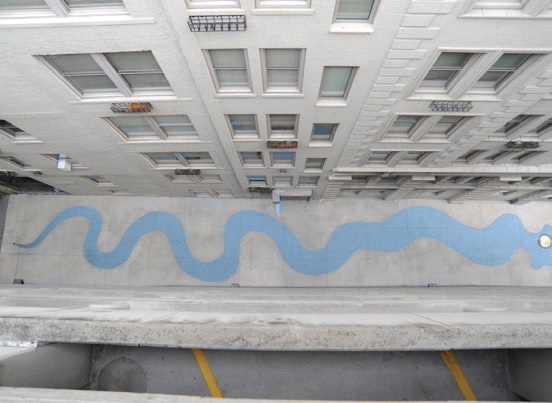 Go here to learn more about Art in the Loop. I hope you will include the small alley off Baltimore between 8th and 9th Sts. Located north of the Bunker Building is a small brick alley that opens onto a peaceful, treed brick patio complete with a small, bubbling fountain as the alley turns north behind the Trozzolo Building. It’s on the list. I really love that spot as well. It’s a simple treatment but it makes the place perfectly pleasant. Should we strike it from the list?